Some 12,000 years ago, groups of people followed the big game up the Mississippi River as the glaciers melted. If they happened to stop in what is today’s Indian Mounds Park they must have been awed by the panorama. There was a huge waterfall that stretched from bluff to bluff. This scenic site contained a variety of trees and shrubs found in oak savannas. The First People recognized it as a special place and, although they lived below near the Mississippi River, chose the area for burial mounds. The early European settlers comment on the beauty of the area and often walked up to the bluff line to experience its majesty. 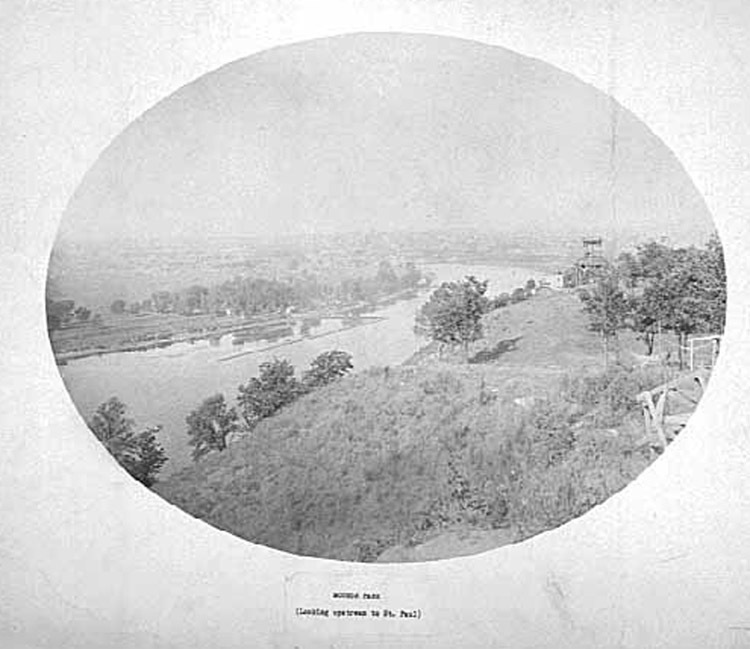 After a St. Paul Park Board was created in 1887, the city decided to buy land in Dayton’s Bluff. However, as a report said, “defeated by the rapacity of real estate speculators, it was not until 1892 that a narrow strip of land along the edge and slope of the bluff on which the mounds are situated” was acquired. It initially comprised around seventeen acres and, after a time, additional land was procured, enlarging the park to sixty-six. 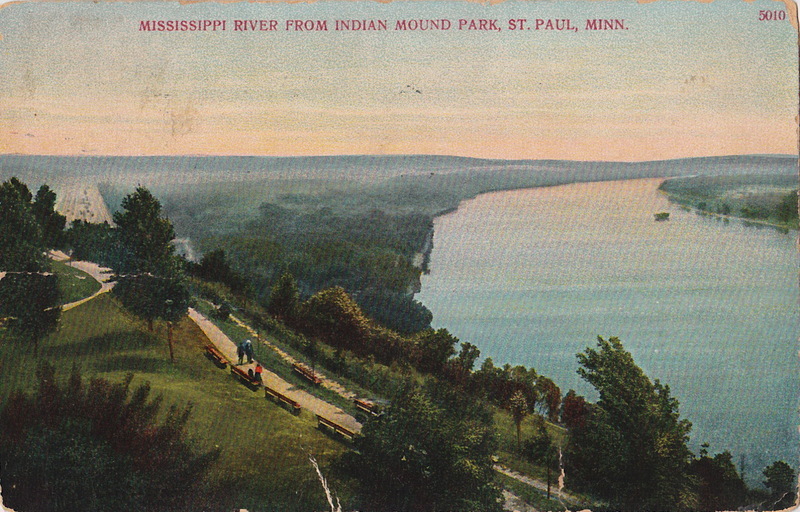 With its history and spectacular views, Indian Mounds Park, was popular from the outset. It became more heavily used when, in 1894, the Streetcar Railway Company started a special service to bring people into the local landmark. 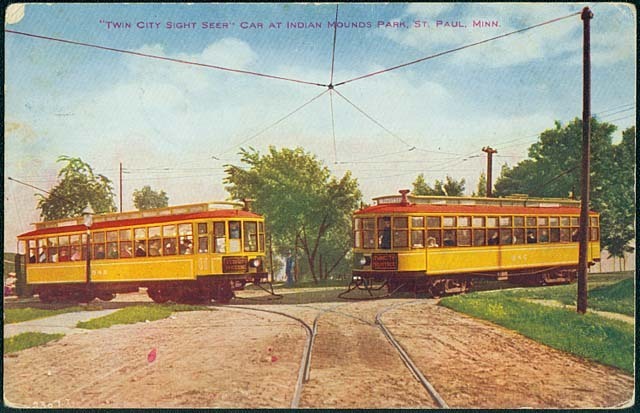 Visitors were now able to travel from downtown St. Paul in around fifteen minutes and often stayed for a full day. 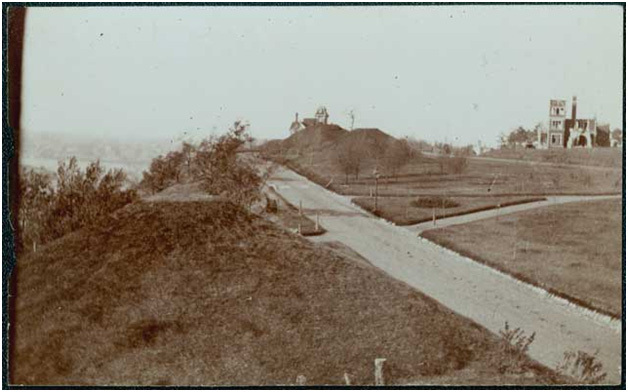 In 1896, the city started grading streets for carriages through the area and as a result, eleven mounds were removed. In 1903 thirty-five acres were added to the park and by 1912 the total amount of land was 135 acres after the nearby state forest reserve on the east was officially added to the park land. Around the same time a series of “parkways” were created to allow carriages to go from park to park. 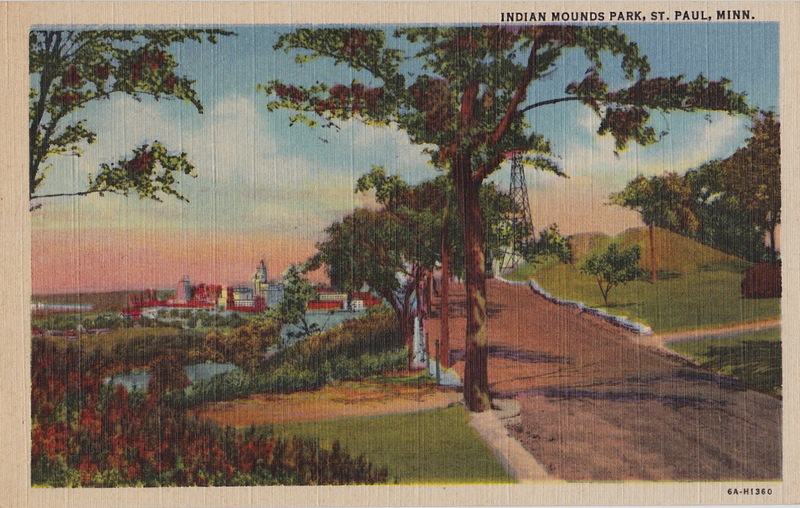 Johnson Parkway, for example, linked up Indian Mounds Park to Phalen Park. 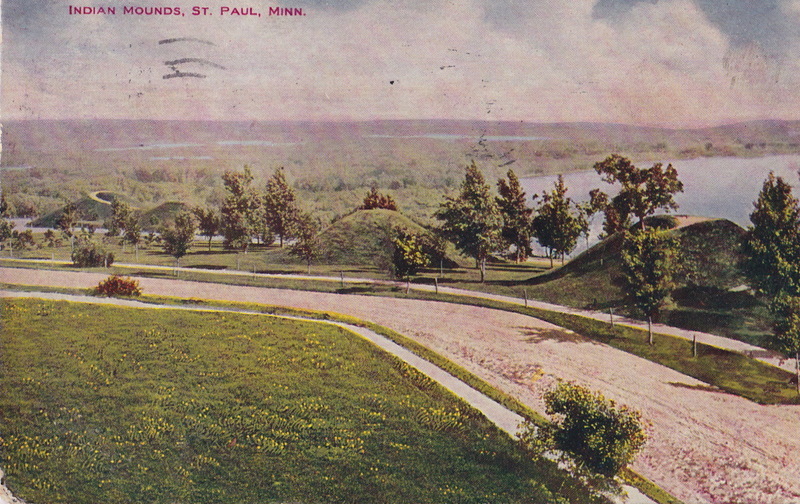 In a decade these roads were used by automobiles and in 1912 Saint Paul removed the ban on motor vehicles in Indian Mounds Park and now horse-drawn vehicles were no longer allowed. 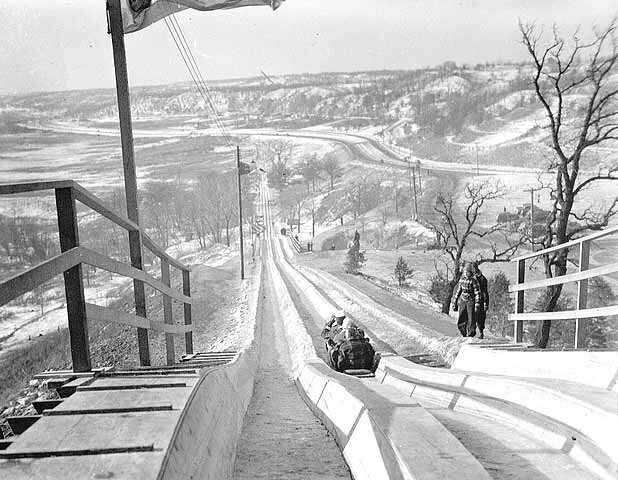 Quite a few minor changes were made in the late “Teens and Twenties.” Various facilities were put in the park--a ski slide, a refectory house, tennis courts, a warming house, six horseshoe courts.. In the 1920’s Mounds Boulevard was paved through the park to Earl Street. The Indian Mounds “were reseeded and put back in their original shape." During the Great Depression the park only operated during the summer. There was little concern for having a playground and few, if any, child-oriented features were added. There was a single brick building, toilets, a stove, two tennis and six horseshoe courts. There were no ball fields, sand boxes or swings and an almost complete absence of play equipment. 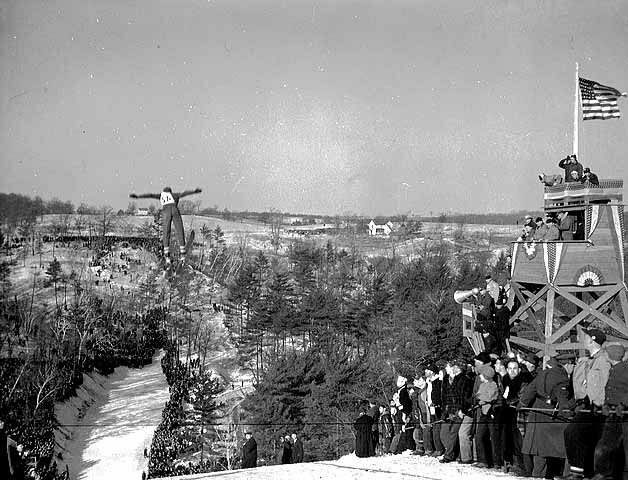 The first major park renovation in many years was undertaken in the 1980’s. Using "Great River Road" funds, the city made improvements, including restoration of the pavilion and removal of the road behind the mounds. The last two houses on the west side of Mounds Boulevard were purchased and removed. Picnic tables, rest rooms and a new children's play area were built. Partly as a response to the increase of joggers and bikers, major new trails and beautification of the bluff line was begun. A new organization named Friends of Mounds Park (FOMP) was started in 2009 to speak up on the area’s needs and to sponsor events. Two years later, members of FOMP and other local organizations convinced the city to undertake the first comprehensive plan for Indian Mounds Park. Their suggestions for improvements which included a new children’s play area and the creation of a small open-air amphitheater were begun in 2013. 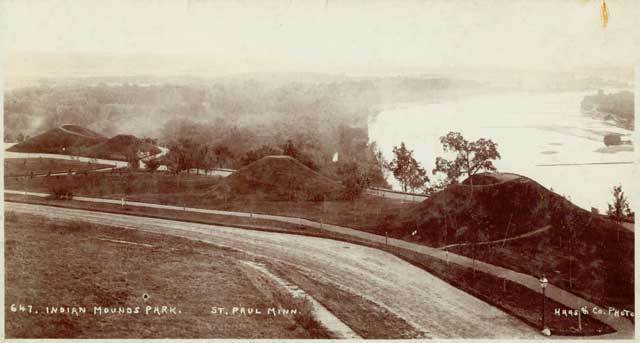 Steve Trimble, “Indian Mounds Park: A Short History,” Saint Paul Historical, accessed April 19, 2019, https://saintpaulhistorical.com/items/show/20.